2m White Angled Figure 8 Power Lead - Power Cable, UK 3 pin plug to figure 8 connector. 90 degree angled fig 8 C7 connector. 0.5m IEC C14 to Cloverleaf C5 Power Cable. Voltage rating 240V AC. Cable type, 3 Core. Colour black. Length 0.5m. 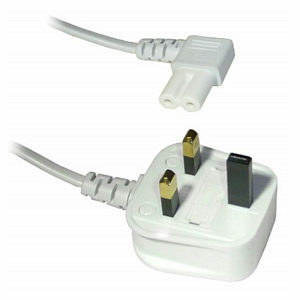 The C5 cloverleaf connector is a 3 pin plug often found on devices such as laptop power supplies. 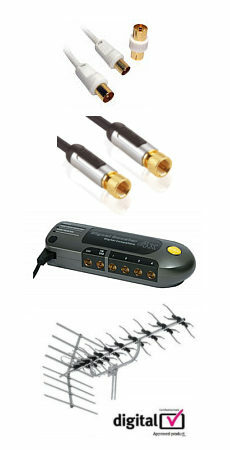 4 gang extension lead, white with 1m cable. Extension strip with 4 UK mains sockets. Fitted with UK plug and 1m of cable. Voltage rating 240V. Current rating 13A. Approval category BS 1361/A. 2 wall-mounting holes on rear.